We spend so much of our life taking the wonder of the world for granted. 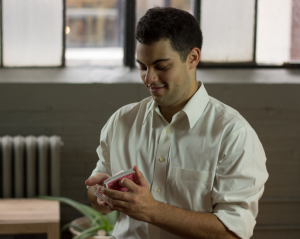 Jonah Babins uses magic to remind people of the delight that can be found in the simplest of places, and he starts with a deck of cards. 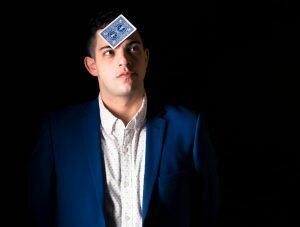 After studying math at the collegiate level, Jonah, instead of furthering his studies or finding a job in the field, looked at his skillset and what he wanted out of life, and now works as a full-time magician. Jonah is a people-person with a calculating mind. 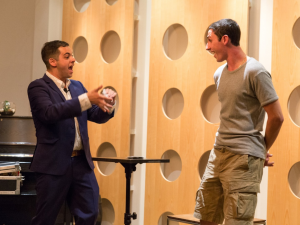 The joy of being a magician, however, doesn’t come from figuring out the technical details of a card trick but from the audience’s reaction. At least, those are the moments in which Jonah feels inspired: in the audience’s dropped jaws and delighted giggles. Jonah grew up in a household that valued entertainment. “There has always been comedy in my family. My parents are very funny.” Although becoming a professional magician wasn’t what either of his parents envisioned for Jonah’s future, they now understand and respect his dedication to it. It is easy to be bogged down by the obstacles facing us, and to think of all of the reasons why something is not possible. Jonah inspires us to believe the very opposite: “It is more fun to think that we can do it than we can’t. When we think we can, our options open up, but when we think we can’t we are only limited.” Magic expands our boundaries of belief, and if we are willing to let our guards down, we can be left amazed at what the world has for us to see. Interestingly, Jonah claims that magic and math really aren’t that different. Just like math, the study of magic is analytic in nature. A magic book, Jonah explains, is written much like a math textbook, with step by step instruction and proofs. The difference lies in the purpose of it all. Jonah realized that, unlike math, the real time results were visible in the audience’s reaction to his work. This sense of purpose drove him to work at his craft. Jonah Babins is a full-time magician working out of Toronto. He runs the Toronto Magic Company, and leads a podcast called “Discourse in Magic”, where he interviews world famous magicians. He is currently on a summer camp tour, putting on shows all over Canada.